MU2 women in action, 2 minutes to go. Danielle launches a made basket from the left wing for the MU3 women. 4 Melbourne uni teams played off in semi finals for the Spartan business house Tuesday competition at MSAC. 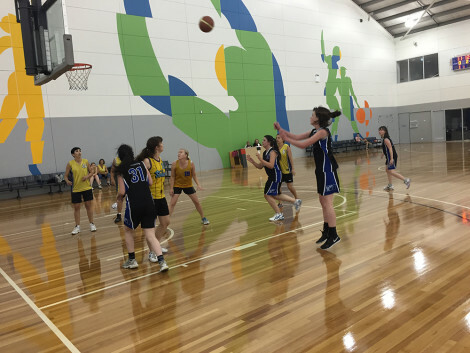 There were no green socks or sweatbands on hand for St Patricks day but there was definitely some rambunctious basketball to be had. First up, the MU2 women faced off against Hunky Dory. 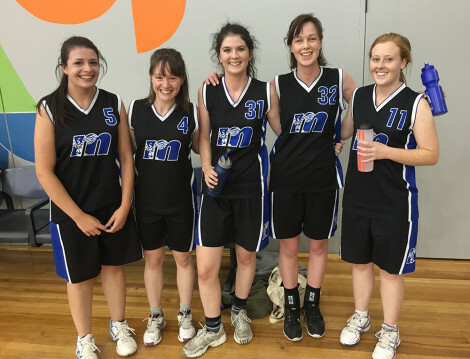 Featuring a few familiar faces from Warrnambool tournament combined with some perky club veterans, MU2 came into this bout spunky and looking the goods. It went right down to the wire and with the girls down by 2 and one minute to play, Kat Hilbert subbed on and immediately nailed a deep three to put uni up one. In a frenetic closing minute with the opposition stealing ahead again on free throws, 'Complete' Kat hit another huge basket to again put uni up with 40 seconds to play. 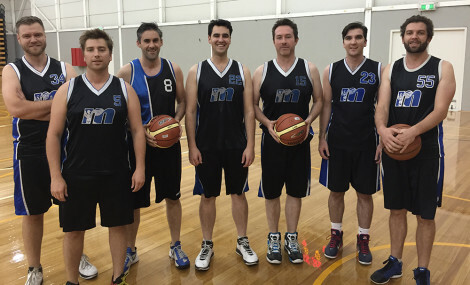 In a cruel twist, victory was snatched away as the opposition cooly sank 4 from 4 free throws with the clock winding down to rip out the hearts of the uni faithful. The 'hand of' Grace (Currie) wisely decreed that the team perform 'mopey face' pose for their ignominious post match team photo. 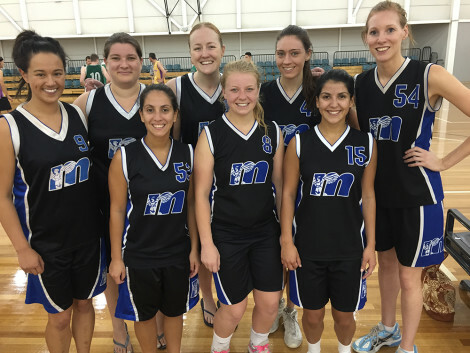 The MU3 girls were under strength and without their bench in their final against the blazers but that didn't stop them. They unleashed a blitzkrieg of basketball 101 against the hapless blazers pointedly marked by a double-digit performance from Caitie 'Get me the rock, i'm hot!' McClelland. In a good team effort, the scoring was well spread and the MU3 girls advance to the next round of finals. Good luck girls! 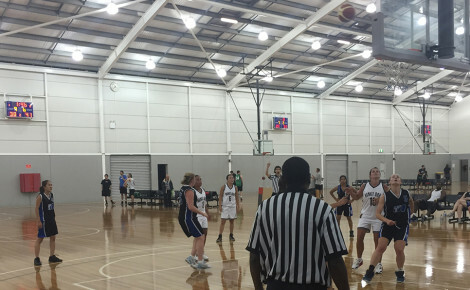 Uni's top girls team were touched up by some deadly opposition shooting in their final. The girls from G's Angels were converting at an incredible clip. Opposition #4 in particular drilled 24 points mostly from beyond the arc. Down 34-14 at the half, Joey and the crew did their best to even the keel and the girls toiled hard on defence all game but it was a case of too much firepower from the other team. 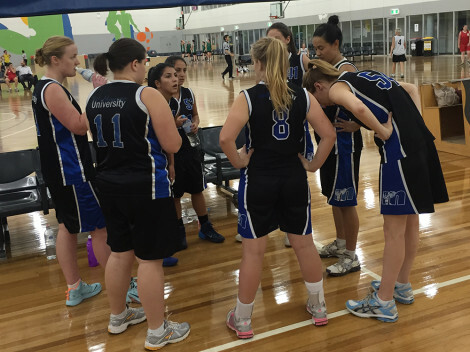 It's been a pretty amazing effort for these uni girls to be playing finals basketball in A grade. Seven years ago, this group started together in E grade and have been promoted up almost every season. "Demolition. Scoresheet was misplaced. 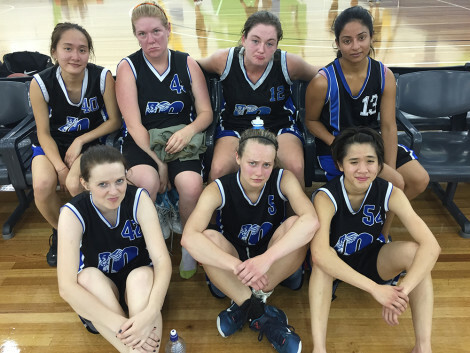 Wasn't pretty"
© Melbourne University Basketball Club 2019. This page was last updated by smoke on March 18th, 2015.